Jared Klim, a journalism student at Southern Connecticut State University, reported this story as part of Journalism Capstone coursework on World War I. The journey to honor World War I veterans in Southbury involved moving the monument as the town developed. The monument, a slab of rock over 5 feet tall with a bronze tablet, currently stands on the green between Town Hall and the Senior Center, with the 65 town residents who served. Surrounded by a flower garden, VFW Post 1607 currently maintains it, and the Public Works Department mows the lawn. Built in the early 20th century after the war, the monument first stood on a spot called Veterans Triangle, located at the old junction of old Waterbury Road and Main Street. That location was the original end destination of the first Veterans Day parade in 1957, where a wreath would be placed on it at the conclusion of the parade, according to the VFW website. “That was called the Veterans Triangle. In the old days, they used to have a cannon that sat there two but they moved it away,” said Malinda Elliott, a Southbury historian. With the development of Heritage Village in 1967, the monument was moved to make room for Heritage Road. According from the 1987 article from The Voices, the road connected the new housing community to Main Street turning, Veterans Triangle into a four-way intersection. 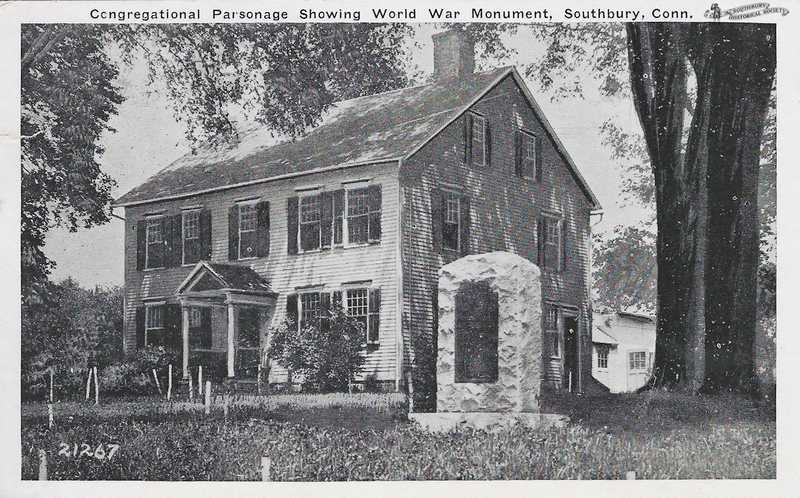 A plaque on the monument reads “In Memoriam” for Harold Davis and George Newton, the only two Southbury citizens to die overseas. Newton also being the first Southbury resident to die overseas had the VFW post in Southbury named after him. The monument now stands along side the Veterans of All Wars Memorial and the World War II Memorial next to Southbury Town Hall. Even with the change of location, the monument remains the final destination of the Veterans parade. The World War I Memorial is the only monument in town with the list of all of those that served in a war. To see a full list of the names listed on the monument, click here to view a PDF file.